I'm thoroughly 'edged up' by LG's 47LG7000. Instead of just talking up its size and picture quality, as you'd expect with a TV sitting near the top of LG's product range, the brand instead feels the need to 'wow' consumers by bigging up the model's Bluetooth functionality. Well, excuse me if I don't do a happy jig around the test room. Yes, the 47LG7000 allows you to wirelessly playback digital photos from Bluetooth-enabled mobile phones, or listen to the TV's sound wirelessly using Bluetooth headphones, but these are not the things AV dreams are made of. It falls to other areas of the 47LG7000 to get me back on side. I started to warm to the TV once it was out of the box. It's a little larger in the bezel than most of today's svelte trendsetters, but the funky rounded edges and ultra-glossy finish help it stand out from the crowd. It also has a scarlet red strip running around its frame; this could have made it feel like a souped-up boy racer car, but instead manages to endow the LG with considerable style. As gimmicks go, it's a good 'un. The 47LG700 has the sort of connections guaranteed to put a smile on my face too, including four v1.3 HDMIs, a USB 2.0 port for playback of JPEG and MP3 files from any USB storage devices (far handier than the Bluetooth stuff, if you ask me) and a D-Sub PC port. An RS-232C output allows for enhanced integration into a wider home cinema system, too, and there are the usual component, Scart, composite and S-video fallbacks. Setting up this TV is fairly straightfoward; I had no problems fixing it to its swivel stand, although at this size you may want to wall mount it. The onscreen menus employ an attractive and intuitive new graphics-based system rather than reams of boring text. And the 47LG7000 is probably LG's most plentifully featured TV to date. In fact, it provides so many picture adjustments that it can be calibrated professionally by an Imaging Science Foundation (ISF) engineer. For my money the most significant of the 47LG7000's features is its TruMotion 100Hz processing engine. In keeping with similar systems employed by rival brands, this both doubles the image's refresh rate, and interpolates wholly new frames of image data designed to fill in the 'gaps' between the real images in a source. LG's TruMotion 100Hz system differs from the competition, though, when it comes to how invisibly it works. I don't mean that you can't see what the processing is doing; in fact, motion is clearly sharper and more fluid when it's switched on. Provided you only use its 'Low' level setting, the system is surprisingly resilient to the usual distracting side effects that often accompany such processing wizardry. There are other processing systems out there that do a more aggressive job of smoothing and sharpening motion – Philips' HD Natural Motion for instance – and there are rare moments of glitching even using the TruMotion's 'Low' setting. But overall I have no doubt that the LG's subtle, natural approach will deservedly win it many plaudits. Also something of a revelation is the 47LG7000's colour fidelity. Colours are extremely vivid and richly saturated – traits common to LG LCDs for some time – but also totally believable in tone, something the brand's flatscreens have struggled to achieve in the past. A great example came while watching a live Premiership football match (Sky HD). The 47LG7000 revealed all the skin tone subtleties – without a trace of colour 'striping' – in pundit Andy Gray's increasingly weathered face. It's also an excellent screen with HD games sources. Hi-def Xbox 360 fare, like Prince of Persia, looks gorgeous. Our Tech Labs found the screen capable of a perfect 6,500K colour temperature, achieved by individual RGB adjustment. Controls are buried in the Expert Control sub-menu. Colour accuracy like this is reliant on sharpness. Here again the set comes up trumps, using its Full HD resolution and LG's XD Engine system to reproduce HD images with pixel-point precision. Nothing looks gritty or forced. The stunning textures in the Blu-ray transfer of the freeway fight in Transformers, for example, have seldom been reproduced better. Picture quality is also aided by the TV's wide viewing angle, and black levels that are probably amongst the best LG has ever managed. That said, the claimed 50,000:1 contrast ratio does not give rise to black levels as good as those offered by the Samsung and Sony-led LCD competition, or most plasma panels – something borne out by our Tech Labs' real world contrast measurement of 862:1. I detected the occasional brightness jump as the set's dynamic backlight system tried to keep up with sharp shifts in source-image contrast, and there's definitely a trace of grey clouding over the night skies during the opening scenes of Batman Begins. Despite this, the LG's black levels are at least good enough to ensure that dark scenes have a cinematic sense of depth, and are natural enough not to be distracting. I often worry about switching from HD to standard-definition material. I've had frequent issues with how TVs – LG ones in particular – handle the non-HD world (and it's a sizeable chunk of most peoples' televisual diet). But again the 47LG7000 bucks expectations, adding sharpness to standard definition images without colour noise side effects. So there's nothing serious to get upset about regarding the 47LG7000's picture performance, and audio doesn't let the side down either. On the contrary, the Mr Mark Levinson-tuned 'invisible' speakers have far better dynamics than most rival flatscreen speaker systems,. So impressive is the 47LG7000's AV performance that all my initial suspicions about it, based on the gimmicky Bluetooth 'headline' feature, have been well and truly put to bed. In fact, the 47LG7000 is so good it tucks in and reads a bedtime story to any such doubts. 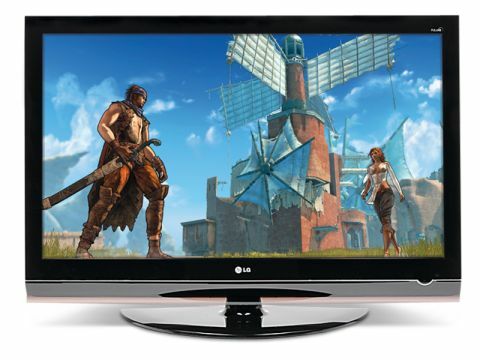 In short, the LG 47LG7000 belongs on the TV performance A-list. It's time to bench your preconceptions.